Toque Flamenco band performs in Vancouver all the time! NEW SHOW at East is East Kits - Every Friday @ 7 pm, starting in November 2018!! NEW SHOW at the Chai Lounge - Every Sunday @ 7 pm, starting in August 2018!! NEW SHOW at the Libra Room! - Starting in February 2018! - selected Thursdays, please check Calendar below! NEW SHOW at the The Kino! - Starting in November 2018! - every second Thursday, please check Calendar below! Keep scrolling down to find out when our next performance is! VISIT TAPAITO's Website for MORE Shows! VISIT TAPAITO's Website for more! March 7th (Thursday): The Kino, 8.30 pm - SPECIAL EVENT! Filming of TF dance documentary ! December 2nd: Polish Canadian Society Christmas Concert- 4 pm - Terry Fox Theatre, Port Coquitlam. May 5th (Saturday): Cavell Gardens, Senior's home - private 5 de Mayo Fiesta! April 2nd (Tuesday): Cabrito, 6.30 pm - book here! April 5th (Thursday): Corporate event (Law Firm), evening, Vancouver downtown Hotel. March 21st (Wednesday): YVR Airport, Haida Gwaii Canoe Stage, 6 pm (Juno week, Host committee). December 31st: 2017 NYE Party - Book now! April 23rd: The Kino, 8.30 pm with guest singer "El Tequila de Jerez"
April 16th: Private performance Wedding - MEXICO !! March 19th: The Kino, 8.30 pm with dancer Cristina Benitez and singer Lucas Ortega (Seville, Spain). Dec 5th, Guest band at "Pianoforte por Flamenco", 7 pm. Get tickets here. November 2nd: Libra Room, 9.30 pm. Follow Toque Flamenco on Facebook! Follow Toque Flamenco on Instagram! The program for the VIFF 2016 has been announced! Toque Flamenco presents its new show: "Bajo la Influencia"
As Flamenco artists raised outside of Spain, Toque Flamenco members grew up being exposed to many different genres of music other than Flamenco. This show is a reflection of the music that has influenced their lives performed as flamenco palos (song forms). Rock classics are the focus of their inspiration. Pink Floyd, Led Zeppelin, Kansas, U2 and The Police are some of the groups that will be interpreted into a traditional Flamenco performance with voice, guitar, percussion & dance. The title is a play on words, just as the composers of these songs were “under the influence” when they wrote the songs that they grew up being “under the influence” of their music. 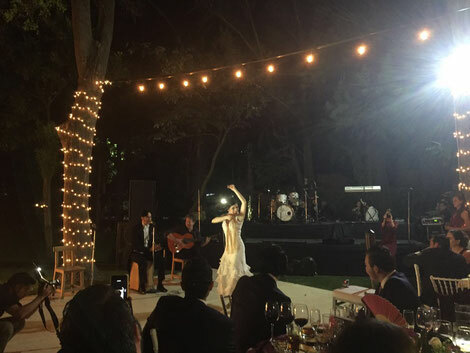 We just want to share with you how exciting it was to perform in Puebla, Mexico for The Wedding in April! 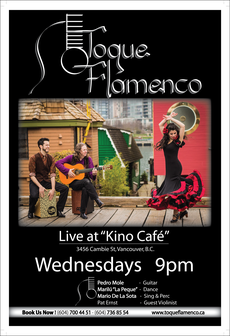 Toque Flamenco is performing this coming Wednesday at its usual Wednesday spot: Kino Café! (Vancouver). Guest violinist Pat Ernst will be there too! Toque Flamenco tonight at Kino Cafe ! This Saturday night, the best Flamenco music and dance in Vancouver is happening at the Kino Cafe with Toque Flamenco and special guests singer 'don' José Lara and great dancer Michelle Harding!